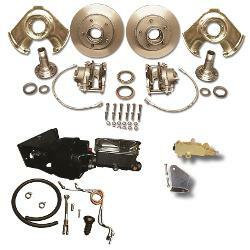 Power Brake Kit PLUS Front Disc Brake Kit for 66-77 Classic Broncos. The front disc brake kit includes Proportioning Valve & Bracket for Disc Brakes. Our Front Disc Brake Conversion Kit is made of all new brake components. This disc brake kit is specially designed for early Ford Broncos and is the best early Bronco disc brake kit on the market. The Power Brake Kit for 66-77 Classic Ford Broncos requires no fender well modification. This kit uses a custom booster that clears the fender well without modification. Kit includes a new push rod, bracket, booster, master cylinder and brake lines. NOTE: Unlike other No-Modify Kits on the market, this kit includes a FULL-SIZED Power Brake Booster, utilizing our Exclusive Bracket to clear the fender well without modification. This booster is a New 8" Dual Diaphragm Chrome Booster. Other kits use a smaller booster to provide clearance. The booster in these other kits does not provide enough vacuum for the Bronco (especially if you are running larger tires), providing dead spots in your braking. NOTE: REQUIRES AFTERMARKET LOCKING HUBS (i.e. Warn, Mile Marker, etc). This kit will clear MOST 15" wheels. Driving my 73 after installing this kit is like night and day. My quads aren't sore when I get home anymore from having to push the brakes so hard! Installation is very simple and straight forward. There are some helpful videos online and I believe that Tom's is in the process of making some of their own. The only challenges that I ran into didn't have to do with the kit but with removing the old stuff. I ended up having to make and run new brake lines from the rear drums all the way up front because the existing brake line nuts were so rounded and in impossible to reach places that I had to cut them out. Power disc brakes are a must have for any Bronco in my opinion. I'm very happy with this product. Remarkably easy installation after I finally got around to it. Only one minor problem that was easily fixed but I thought I'd pass it on. The keyed hole that mounts the reverse light switch on the bracket had to be drilled round to allow the switch to be turned sideways to fit under the vacuum booster bracket. Stock vertical position would not clear the underside of the booster mount. Otherwise all ok. Should have done it long ago. I purchased this kit for my 1968 Bronco with a Dana 30 w/slingers. This is a quality kit. I'm so happy with it. Everything went together like the instructions said. I watched the TBP YouTube video to familiarize myself with the kit before I started. When installing the power brake unit, be sure to find the reverse light switch on top of the steering column if you're still running stock 3 speed. I simply flipped this piece over to get the clearance I needed. The other modification I had to do was one of the two up lines from proportionate valve to master cylinder needed to be straightened out and re-bent to line up with the new master cylinder. I took my time and bench bled the master cylinder and thoroughly bled all the lines. I'm running 35" tires and the brakes work great! I have so much peddle and have not found a dead spot. I've been driving everyday for the last three weeks and I think the brakes are better than my 2016 F250.